Mark Your Calendar for Captivating International Charity Events! Captivating International believes that within every child lies the potential for greatness. Their mission to see disadvantaged, impoverished, poorest-of-the-poor children soar for a better tomorrow. Don’t miss out on these upcoming events and support Captivating International’s great cause! Captivating Santa Run – Saturday, December 8th, 2018 at Guangdong Sheng, China. Please join us for a really fun festive morning to help raise funds to bring hope to underprivileged children and families in Qinghai. Everyone is welcome, from serious runners and joggers to walkers and families! Come in your favorite red, white or green outfit or festive best! There will be a LIMITED number of Santa suits for the first 100 to arrive on the day who wish to wear them. 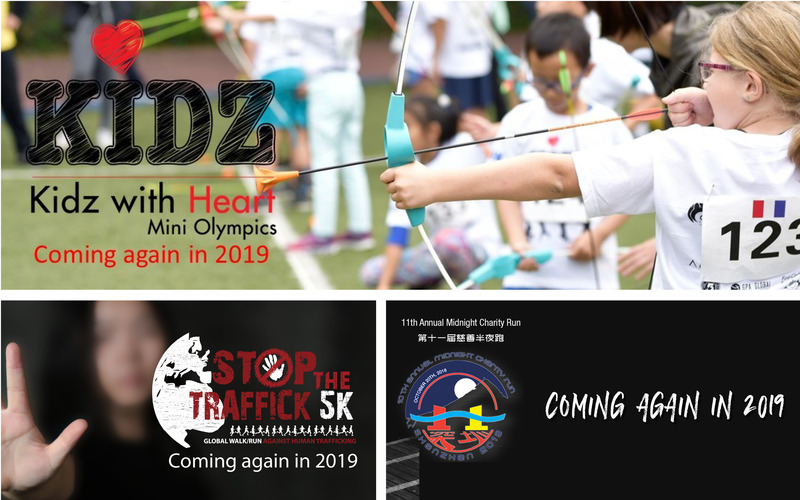 Kidz with Heart Mini Olympics – Coming in 2019 at Shenzhen, China. Represent your home country in a Mini Olympics for Kids, with lost of sports and other fun activities. All funds raised help impoverished children in China reach out for a better tomorrow. Stop Human Traffick 5K – Global Run/Walk during month of September, 2019. Anytime during September, all are invited to join our global Stop the Traffick 5K! Get as many people as you can to run or walk ANYWHERE, ANYTIME and unite with us to STOP HUMAN TRAFFICKING. More Precious than Diamonds – Coming in October, 2019 at Guangdong Sheng, China. EVERY THREE HOURS a girl somewhere in China, Nepal or Africa has her life significantly and positively impacted by a Captivating supported program. Help us keep our China partners and programs progressing. With your support, 1,000 girls in China and many of their families will see their lives transformed this year. 11th Annual Midnight Charity Run – Coming in 2019 at Shenzhen, China. Dare to finish 5km or 10km run in 30 or 60 minutes for a charity cause? 100% of registration fee will support Captivating’s Charity work in China. Registered now to support!